Two days of 8 parallel sessions on sports analytics, a hackathon, a startup and research paper track, workshops, and even a drone racing and e-sports competition. 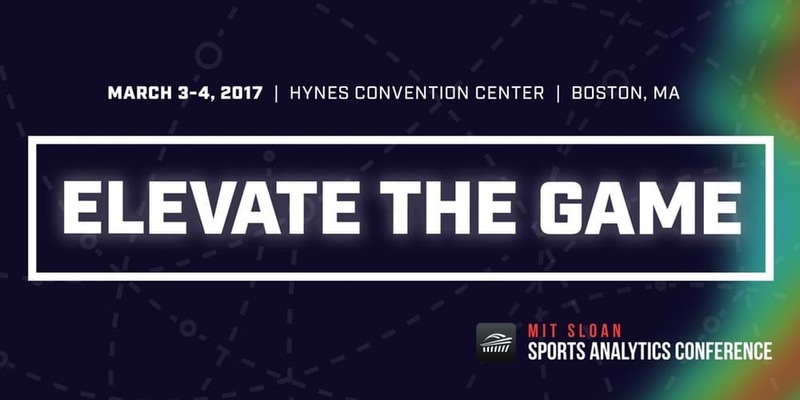 That’s what the 11th annual MIT Sloan Sports Analytics Conference (Boston, March 3-4, 2017) is all about. It brought together 3500 people from around the globe, and therefore can be seen as the must-attend event in this area of sports technology and innovation. 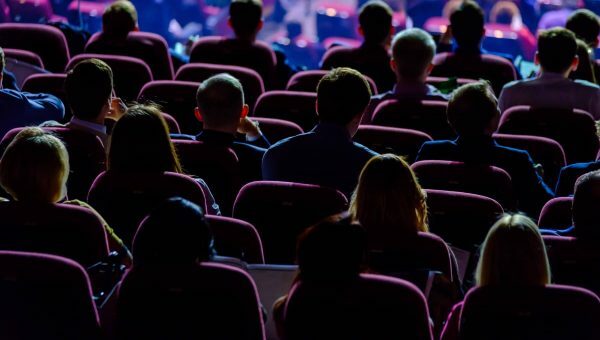 As it is impossible to give you a complete overview of what is said during this year´s conference, I will highlight the most interesting learnings that I captured during my visit in this (2 part) blog post. I mainly focused on the sessions relevant for athletes, teams, trainers, etc. and not on those on sponsorship, (social) media and marketing, e-sports, team management, gambling, broadcasting, etc. since we are not active in these parts of the industry. Every good conference starts before its official kick-off. In this case, I cached up (just as last year) with Jan Van Haaren (a Belgian PhD on sports analytics) and his new colleagues at SciSports (a promising Dutch startup) in a bar close by the TD Garden. We discussed the evolution of sports analytics from a Belgian-Dutch point of view and how this relates to what´s happening in the rest of the world. 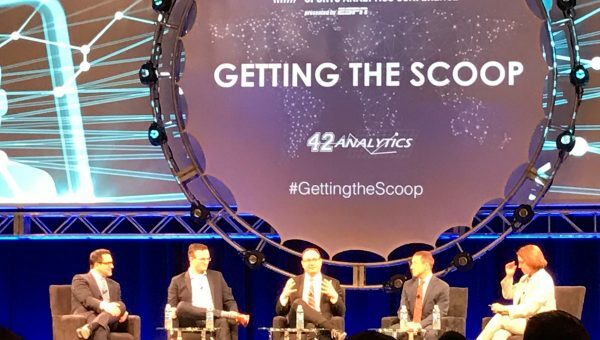 Conclusion: things are changing at an enormous pace, and it´s up to the believers of sports analytics to show the real added value to those working in the field. We ended up in the Boston Celtics – Cleveland Caveliers NBA game. Not sure to what extend analytics had to do with it, but the Celtics won this very close and attractive game! Real-time. Coaches on the side and fans in the stadium want the most relevant information as soon as possible e.g. on their tablet or smartphone, preferably in real-time. Sports is all about ‘the moment’. A company that is doing a great job in this, is ShotTracker. With a sensor on the (basketball) shoe, in the ball and around the court, these people are able to collect and send statistics in real-time to everybody connected to the cloud. Personalized. Sport is about individuals. So as an athlete or fan, you want tailor-made information relevant for you (and your team). On the level of training and rehabilitation, individualization is something that is already quite mainstream (although further developments need to take place). Larger challenges exist in the fan engagement area of sports (ticketing, merchandising, retail, etc.). Even companies as Nike and Ticketmaster are struggling with big data analytics leading to personalized shopping experiences. Integrated. As an athlete, trainer, analyst, etc. you don´t want to use a multitude of apps or software applications. One is enough. However, this is currently a hard thing to do. Most companies don´t allow you to use (raw) data in order to combine it with other data sources, thereby gaining additional insights. Every company wants you to buy and use their hard- and software products. However, companies are becoming more and more aware of this issue. Therefore, we tend to see more and more clusters of complementary tech organizations. As for Nike and Ticketmaster for example, people would receive reductions on particular shoes or shirts after buying a particular game ticket online (note that this is currently not yet the case). Acceptable. Many technologies are already out there on the market, but who is waiting for all of these? In particular in team sports, coaching and analysis are still two different worlds, talking a different language. The analyst is thinking in figures and charts about the next breakthrough, while the coach just wants to win that next game and needs the right video replays right now in his office so the team can start practice. So, in order to get more of the technologies accepted by an increasing amount of coaches and teams, these two need to come closer together. The good news is that this is happening fast now in many countries and sports, as is nicely made clear during the various panel discussions at the Hynes convention center where the conference took place. Relevant. If technology companies want to sell more, and data analysts want to become more important within the sector, they will need to develop and apply products and services that matter. A company that is doing a great job on this level is Metrica Sports. 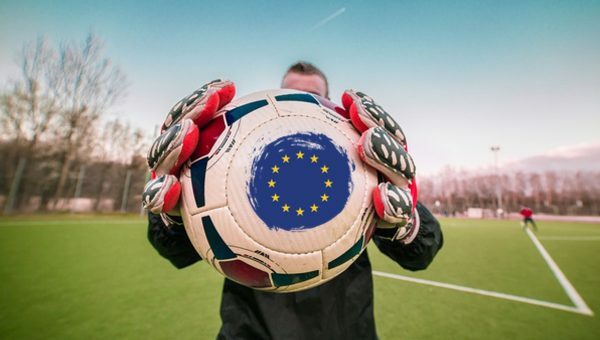 Their soccer analytics software is developed on the basis of the input of a large series of interviews with elite European trainers and coaches. For each of their clients, they also develop tailor-made algorithms and alarms in order to detect aspects of the game that are almost impossible to see with the human eye, but do matter in terms of chances on success. Clubs as Villareal and FC Barcelona are already clients of this young but promising startup. User-friendly. Just as with other-than-sport products that we tend to buy, these need to be easy to use, meaning: quick and intuitively without many rational thinking activity needed. Fitness, running and biking apps are (in general) already quite ok, whereas for many of the more advanced (team) systems, this is not always the case. Accurate. This is definitely a very huge topic nowadays. The large rise of sports technology that is seen in recent years has mainly been introduced by commercially driven organizations. Many startups, SME´s and larger (multinational) companies have tried to penetrate the market with an as-low-as-possible development, production and distribution cost. This has led to the situation e.g. that many of the wearables lack accuracy, as is shown in scientific research papers as this one. The same is true for player tracking (and many other) technologies. Uniform. Building further on the previous point, data from different technologies can often not be compared to each other. For example, if you buy a new power meter for your bike, the chance is high that you will be unable to estimate to what extend the data is different from your previous tool (assuming you bought a product from a different brand). The same is true in soccer, basketball, etc. If (national or international) leagues want to get smarter by using (big) data, every club of course needs to use the same system, or systems need to be standardized, which is currently not the case at all (except for some bigger leagues as the NBA where previously STATS and now Second Spectrum are used nation-wide). Automatic. In the ideal situation, technology helps there where human capabilities are pushed to their limits, preferably without any further human effort. Personnel is expensive after all. A company that is exactly working on this issue is Keemotion. They provide camera and video technology to automatically capture basketball games, without any human interaction, just as would be done by a team of professional camera men. Imagine the possible cost reductions this may imply. In addition, this may open up many new possibilities for less capital driven teams to capture and send game videos to fans, sponsors, media, etc. Predictive. For many purposes such as scoring more goals, optimizing training or preventing injuries, you need insights that have a predictive value and meaning. Only so one can decide what to do and/or change in order to induce a different result. In this regard, the British cycling team explained how they try to predict future (Tokyo 2020 and Los Angeles or Paris 2024) Olympic medal talent. However, overall, predicting the future remains a very hard thing to do. Cheap. In order to make sports tech more mainstream, costs need to be minimized. In the consumer goods market, this is already done quite well given its scalability options. However, in many organized (team) sports, very limited to no money is available for this. Companies as Myagonism, Hudl and NBN23 profile themselves in this part of the market. It´s their mission to deliver products and services to lower division and youth teams, in a similar way as others do at the top. So on a global scale, a very large part of the sector is still open for future product innovation and implementation. The amount of sport product innovations is currently exploding. Advanced developments on a variety of technology levels (smart stadia, biomarkers, imaging, e- and m-health, materials, microsystems, textiles, nutrition, augmented and virtual reality, artificial intelligence, …), are currently leading to a rapid change in the way we perform and experience the different aspects of training and competition. Times in this sector have never been so exciting! But does it really matter after all? Check it out in the second part of this blog post. Read the article on this topic in Dutch on Knack Sportmagazine.